70 year-old male with a pancreatic mass. 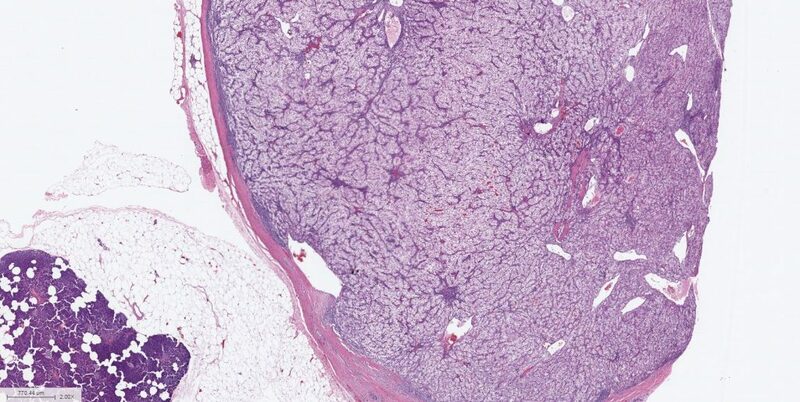 Histology: This resection specimen shows distinct nodules with fibrous capsules and peripheral lymphocytes, with adjacent histologically unremarkable pancreatic parenchyma. The nodules are comprised of nests of cells with clear-to-fibrillary cytoplasm, atypical nuclei with focally prominent nucleoli, occasional mitotic figures, and numerous capillaries with “chicken wire” pattern. The lesional cells are diffusely positive for Pax8 and are negative for synaptophysin and chromogranin. 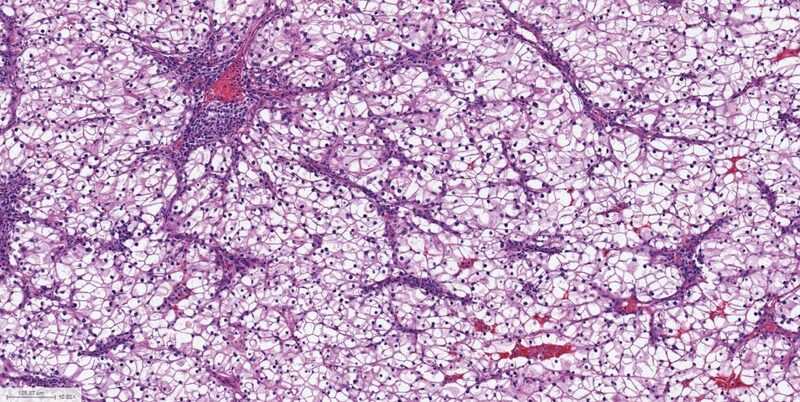 Discussion: This is a metastatic clear cell renal cell carcinoma (RCC) to the pancreas. The main differential diagnosis in this setting includes primary pancreatic neuroendocrine tumor (PanNET) with clear cell change. This differential diagnosis is particularly challenging and important because both clear cell RCC and PanNETs with clear cell change occur in patients with the von Hippel-Lindau (VHL) syndrome. VHL syndrome is due to autosomal dominant mutations in the VHL gene located on chromosome 3, and patients with VHL are susceptible not only to the former lesions, but also to hemangioblastomas, pheochromocytomas, retinal angiomas, endolymphatic sac tumors, and epididymal papillary cystadenomas, among other lesions. In addition, not only are patients with VHL susceptible to both clear cell RCCs and PanNETs with clear cell change, clear cell RCCs are among carcinoma types that metastasize to “unusual locations” such as the pancreas and thyroid. (However, clear cell RCCs do also metastasize to more “typical sites” of metastatic carcinomas, such as lung, adrenal, and brain). 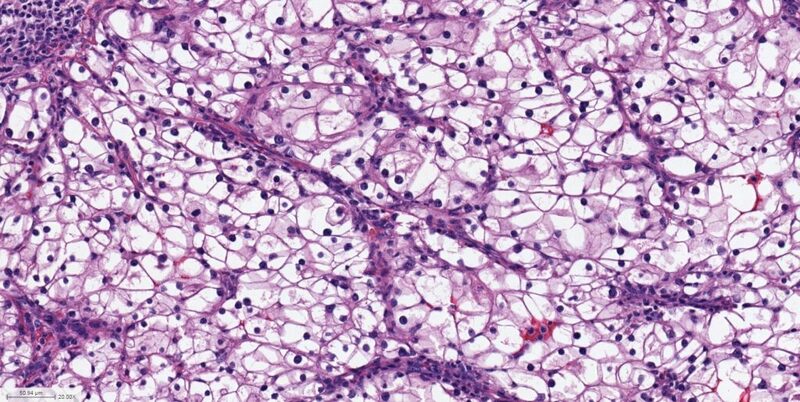 Clear cell RCC are also unusual in that they may metastasize after a long disease-free interval, such that the pathologist may not be aware of the clinical history. Immunostains can help resolve the differential between clear cell RCC and PanNET with clear cell change; however, there is a serious pitfall! Clear cell RCC are classically immunoreactive for Pax8, but PanNETs can also label with Pax8! Thus, immunostains for neuroendocrine differentiation, such as synaptophysin, chromogranin, and CD56 must be included in the immunopanel. In general, clear cell RCC are immunoreactive for Pax8, CAIX, CD10 and vimentin, and are negative for neuroendocrine markers. PanNETs, including those with clear cell change are immunoreactive for neuroendocrine markers and can be positive for Pax8. 1. Hoang MP, Hruban RH, Albores-Saavedra J. 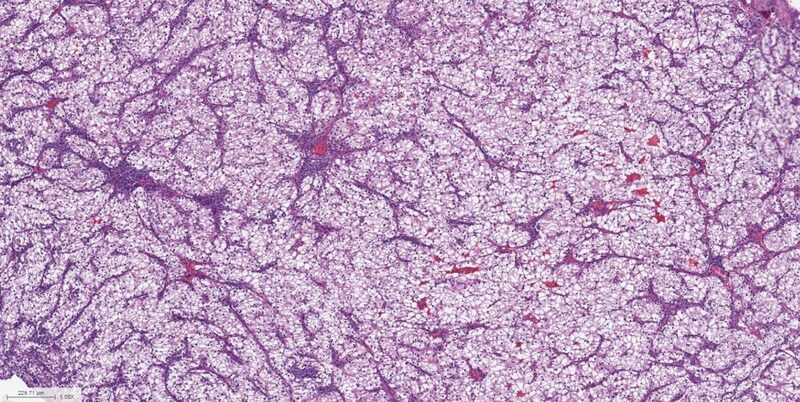 Clear cell endocrine pancreatic tumor mimicking renal cell carcinoma: a distinctive neoplasm of von Hippel-Lindau disease. Am J Surg Pathol. 2001 May;25(5):602-9.